While you know the rules of the road in your own state, that does not mean that those in other states are the same. If you plan to travel or even move to California, you’ll need to make sure you are aware of any laws that differ from your home state. Below are some of the rules of the road for California drivers of which you need to be aware. Children under 2 years of age who weigh less than 40 pounds or are under 3’ 3” tall must be in a rear-facing child safety seat. The driver and all passengers who are 4’ 9” or taller or 8 years of age are required to wear safety belts. Children younger than eight must be in an appropriate safety seat for their height and weight. Children weighing less than 20 pounds, under 1 year old or who are in rear-facing safety seats can’t ride in the front seat if the vehicle has a passenger airbag. It is illegal for a minor with either a permit or a driver’s license to use a cell phone while driving. Drivers 18 and older can only use cell phones with voice and hands-free operation. Pedestrians, bicyclists and motorcycle riders have the legal right of way, even if performing an illegal maneuver. Drivers must yield right of way if not doing so will cause an accident. A driver that is facing downhill on a steep, narrow road must back up to allow the vehicle driving uphill to pass. Funeral processions have the right of way. It is illegal to leave a parked vehicle running when the driver is not present. When parallel parking, the tires of the vehicle must be within 18 inches of the curb. It is illegal to park on the wrong side of the street, such as when parking is allowed on one side only. Bicycles - Bicycles ridden after dark must have either a red reflector or a red flashing light that includes a reflector on the rear. Slower moving vehicles - Drivers who have five or more vehicles directly behind them on two-lane roads are required to pull over when it is safe to do so to allow them to pass. Traffic accidents - If a driver is involved in an accident that causes $1,000 or more in property damages, he or she is required to submit a Report of Traffic Accident Occurring in California form. Unlicensed drivers - It is illegal for a person to loan a vehicle to a person who does not have a license or has a suspended or revoked license. Unattended children - Children under the age of 6 can’t be left in a vehicle alone. A child 12 or older can supervise younger children. Passing - If a trolley, bus or streetcar is stopped at a safety zone or intersection, the maximum speed limit for passing is 10 MPH. Three second rule - Drivers must follow the “three second rule,” which means there must be three seconds of space or more between you and the vehicle in front of your vehicle. HOV lanes - Drivers must follow the posted minimum number of people in vehicles permitted in the High Occupancy Vehicle Lanes (HOV). However, low emission/hybrid vehicles with a decal from the DMV and motorcycles can use the HOV lanes unless otherwise posted. Headlights - Headlights must be turned when weather conditions require the use of windshield wipers. 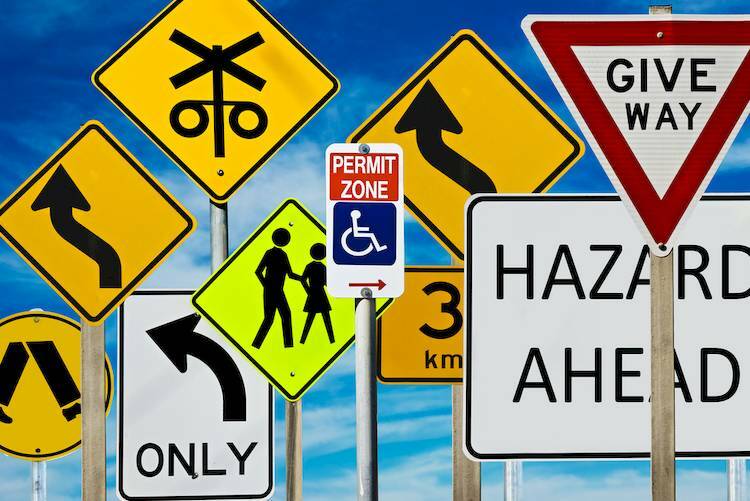 Sight seeing It is illegal to drive to a location where an accident, fire or other type of disaster has occurred and is in the process of cleanup in order to sight see. Smoking - It is illegal to smoke in a vehicle if minors are present. Following these rules of the road will make sure you are legal when driving in California. If you need additional information, please check the California Driver Handbook.